Sunday School is held Sundays at 10:15 a.m. during the school year. There is no Sunday School or Confirmation on Easter Sunday. Sunday School and Confirmation teachers are: Cindy Appleton, Phil Laube, Irv Laube and Andy Appleton. Confirmation is held two Wednesday evenings a month and each Sunday during the school year for youth in 6th and 7th grades.This year these evening classes are held at the home of Irv & Jennifer Laube in Dike. In an effort to reach more of our families with younger children, we held opening and closing Vacation Bible School this summer with sessions held during our regular Sunday School time. On Sundays, July 10th and 17th, we held VBS from 10:15 to 12:30. 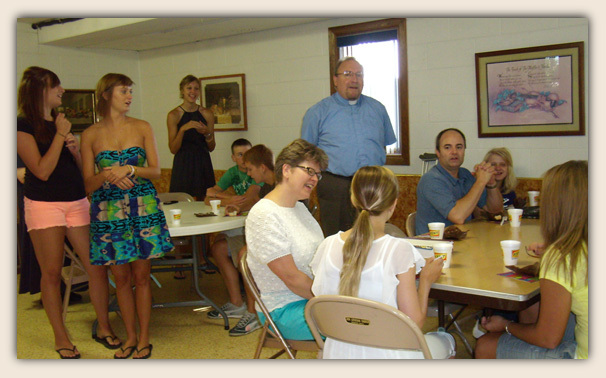 We also held a Wednesday evening session on July 13th from 6:00 to 8:00 p.m. The theme this year was "Prayer" and there will be classes for adults as well as youth. The women of the church meet the first Monday of each month at 1:30 at the church. Pastor Mark chooses and leads an informal and interesting Bible lesson each month. These monthly gatherings also include a brief business meeting, planning, snacks and fellowship. The women support numerous missions with their offerings and yearly fund drive. The women of the church plan and organize most of the hospitality events and funeral lunches that take place at the church, as well as quilting. Everyone is welcome to join in this time of quilting beginning at 9 a.m. on Mondays from September through November. A potluck lunch is enjoyed at noon. Work as often as you can for as long as you can.